Good Friday morning! 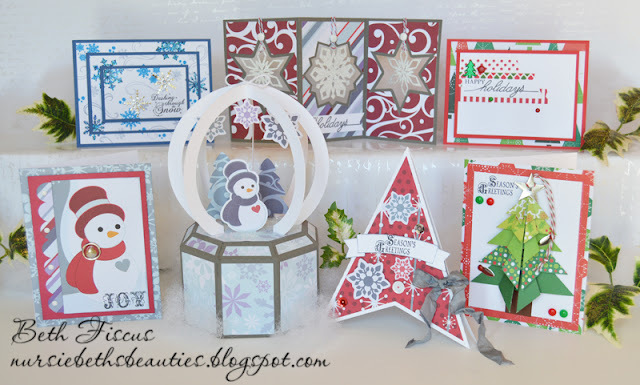 I super excited to share some fun Christmas/Winter projects that I created using Oriental Trading's fun scrapbooking supplies. Here is a look at the whole group that I will be sharing with you in this post. First up, I created this snowman card. 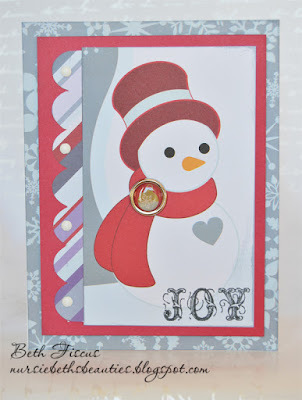 It was quick to create with the patterned papers in the Winter Wonderland paper pack. I also used a scalloped border from Winter Wonderland Die Cuts as well as brads from the Christmas embellishment kit. 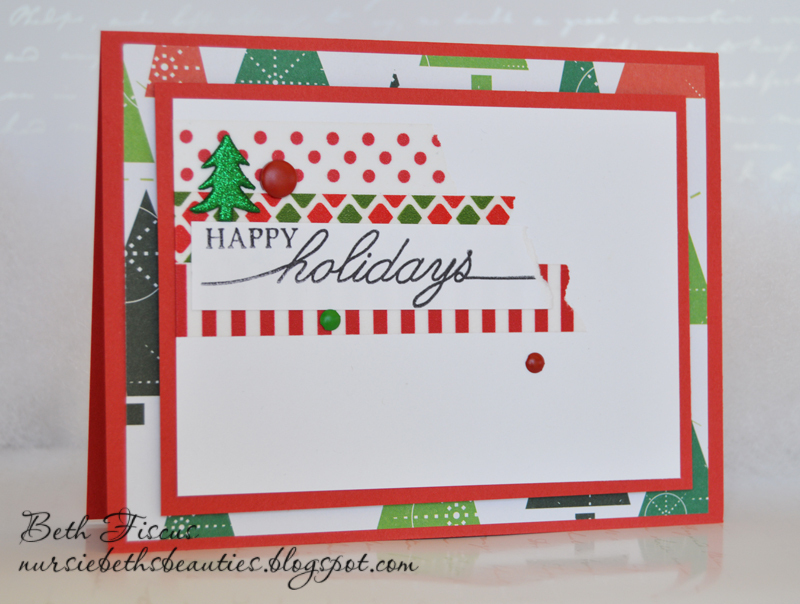 The sentiment is from the "Happy Holidays" stamp set. For card #2, I wanted to try a technique that is popular in the crafting world, but I had never used it yet! It is called triple time stamping. You keep the layers of white paper stacked on top of each other while stamping so the images all line up. 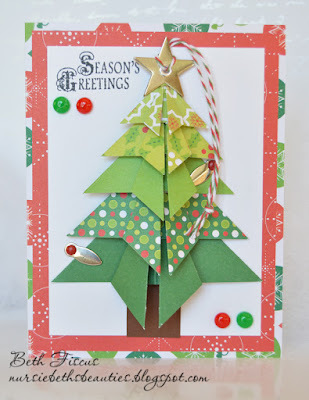 For this card I used cardstock from Super 150 Paper Sheets pack. The silver snowflakes are from the Christmas embellishment kit. 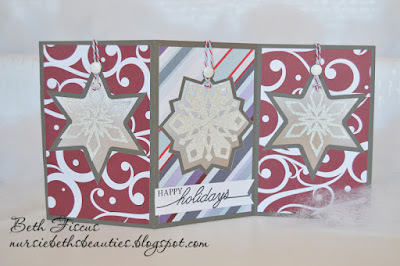 I used two stamp sets called Snowflake Scrapbook Stamps and "Happy Holidays" stamps. This card is a fun teepee style card. It can be folded flat and the recipient will tie the bow on the side, creating the triangular shape. The SVG file that I used for this is from SVG Attic's JGW Vintage Valentine set. 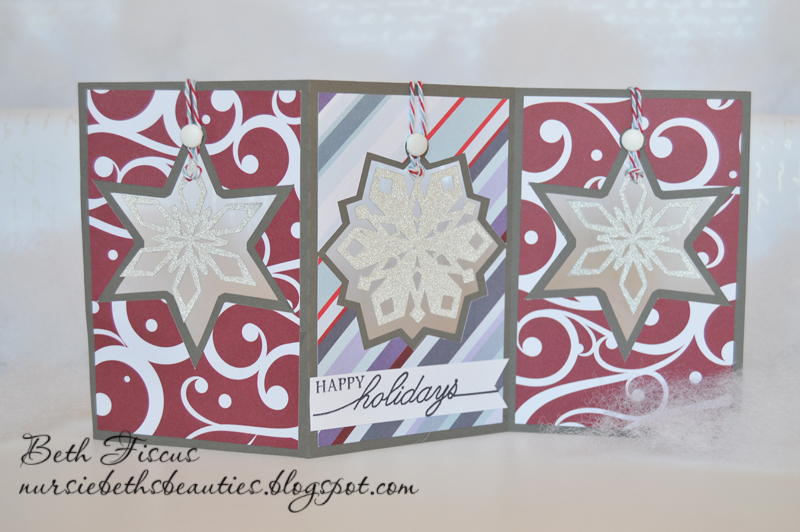 I used white cardstock from Super 150 Paper Sheets pack and snowflake die cuts from Winter Wonderland Die Cuts. To finish it off, I added sequins and a bow of Grey-Gray crinkle ribbon from 3 Girl JAM. This card is one of my favorites of this set. Why? Because the origami tree is actually an ornament! It is simply held in place on the front of the card by the silver frame anchors, which can be rotated and the ornament is ready to hang on the Christmas tree. The patterned papers are all from the Christmas/Winter Mat Pack. 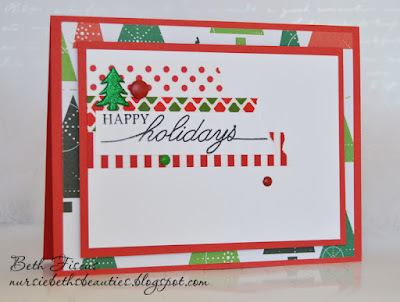 The sentiment is a stamp from "Happy Holidays" stamp set. 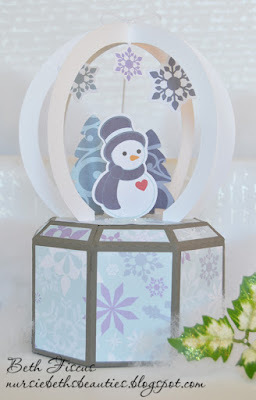 Next up is a darling gift box snow globe. I had a lot of fun choosing what Winter Wonderland Die Cuts to use to create the winter scene inside the globe. 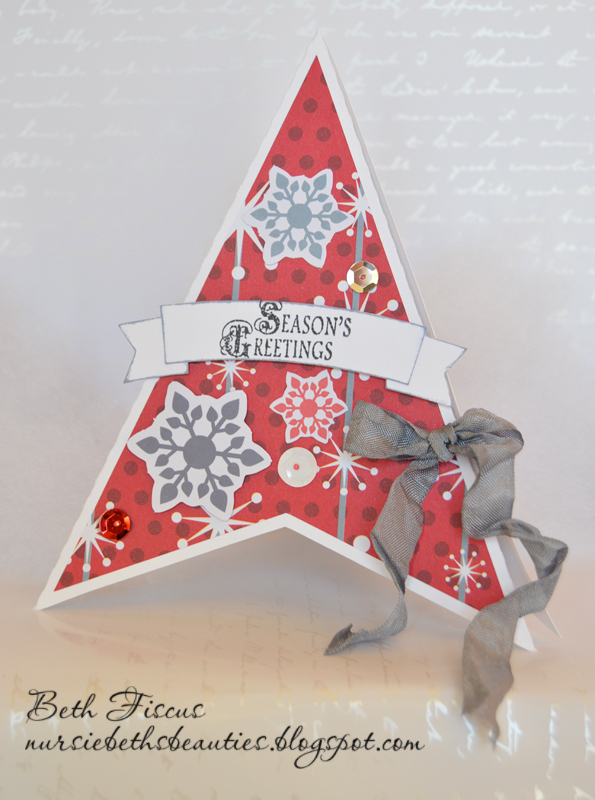 I used patterned paper from Winter Wonderland Paper Pack and cardstock from Super 150 Paper Sheets pack. The SVG files I used for this are from SVG Attic's Snow Flurries set. This card is another unique one! It is a tri-fold card that is double sided. It can create a beautiful display or you can loosen the brads and the snowflakes can be used as ornaments. I used patterned paper from Winter Wonderland Paper Pack and cardstock from Super 150 Paper Sheets pack. 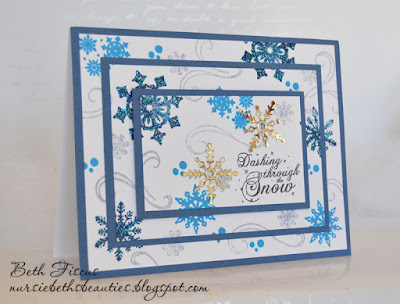 The snowflakes are cut from DCWV's Glitzy Glitter stack and the sentiment is from the "Happy Holidays" stamp set. 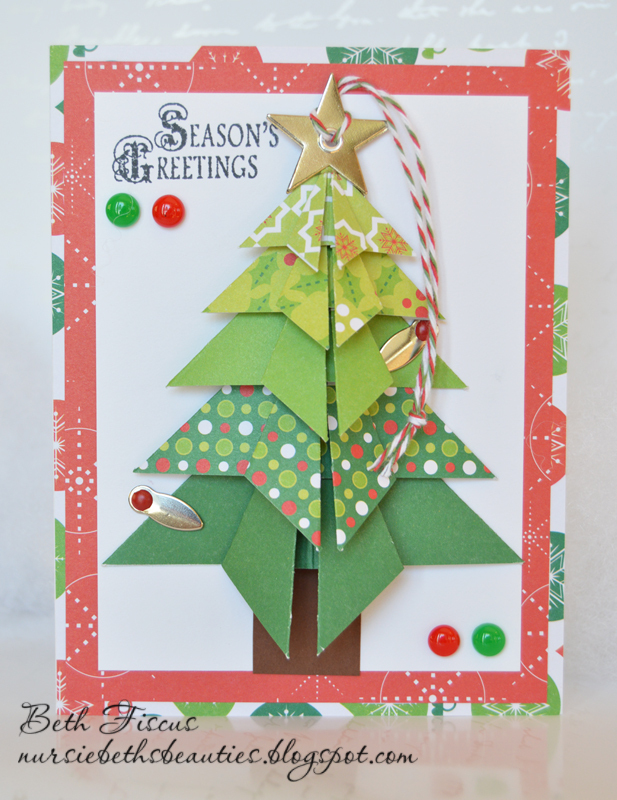 The file I used to create this card is from SVG Attic's Ornament Kit. The patterned papers on my final card are all from the Christmas/Winter Mat Pack and cardstock is from Super 150 Paper Sheets pack. I used washi tape from the Red Washi Tape set as well as the Christmas Washi Tape set. The sentiment is from the "Happy Holidays" stamp set and the cute brads are from the Christmas embellishment kit. Whew! That was a long post! I hope you enjoyed seeing all of these creations as much as I did making them. It is always fun to use scrapbooking products from Oriental Trading. I definitely recommend you checking out all that they have to offer in that department. The review of these products is based strictly on my opinion. Others may have a different opinion or experience with the products listed above. I was provided the samples free of charge by Oriental Trading Co. and I provided my honest opinion. No other type of compensation was received for this review.